Dad came over on the weekend so we could start on the porch and a little project in the back garden. He came in his usual style, with lots of equipped and machinery, there was even a different dumper for me to play with (I'm not aloud on the digger when he's here!). The front door before work started. Removing some horribly invasive shrub. Unfortunately it also showed us how unstable the garden wall is in the back garden. The footings dug. even though it's just the porch we went to the same depth as the house footings. Building inspector was happy. Concrete poured in. I went for quite a deep fill as it saves a lot of brick and block work. Dad's dog found it hard work as well! I've got a bricklaying friend coming round on Monday to bring the brick and block work up to damp, plus some jobs in the garden and to see what he suggests with the wobbly wall. Hopefully the porch won't take too long and then we can crack on with the extension, although I'm sure it's my bits that will take the time! Well it's been a year since I've taken over the duties as being the stay at home parent. I really wasn't sure how I'd cope with it long term, and talking to my family neither were they! They were worried I'd struggle with the lack of male company and not have enough to keep my mind busy or be productive. In fact it's been the opposite, I've made lots of "mummy friends" at playgroup, many share the same type of mindset and enjoy talking and doing the same things as me, gardening, frugality, baking, etc. It's been great meeting up with them and having them to talk to for adult conversation, it's been a year since someone tried to talk about football to me! I've also kept myself really busy, I've been working on every Saturday and every school holiday with lots of little carpentry jobs for people and I've had plenty to do on the homestead here, growing a productive garden, baking, housework, decorating, DIY, fencing, planting trees, looking after the chickens, sourcing firewood, saving money... well you get the point! Don't be fooled - they're trouble. Then there's been the best bit - my girls. I've got to spend more time with them than I ever thought I would and it's been amazing. I love every minute of it and even though it's been hard at times, through the tantrums, tummy bugs and pooey bums, I wouldn't change any of it. I feel like I know my girls so well and we have such a great time together, I know in years to come I'm going to look back on this time with fond memories. I feel like I'm a very lucky man to have this opportunity and to have a wife would is happy for me to stay at home while she goes to work, without all her hard work none of this would be possible. I married a truly amazing woman who puts up with a lot! I'd also like to thank all my blog readers and commenter's for keeping me on my toes this last year, for giving me new ideas and things to try and for constantly encouraging me. I think everything combined has made this last year the best year of my life so far! There was some excitement this week (from me anyway) as I managed to do a deal to rent out some fields next door to our homestead. The top patch. The oak trees in the middle mark where an old hedge used to be and I'll probably run an electric fence up there to divide it up again. It's about 8 acres split into two fields although they'd be easily split into three. We're renting it as grass keep so have to be off the land for two months a year and although it's only eight acres it should help in producing more food for us and more to sell. It literally couldn't be any nearer to us as they were once part of the same estate, the fields are much better drained than ours and slope south rather than north. . Looking up from the bottom of the top patch. the bottom patch, really lush grass here. Road access is poor to the bottom field but most tractors can fit through. I also made a call to a shepherd that I used to help as a child/teenager and he's going to hopefully purchase us some ewes with lambs at foot to put on to the fields. It'll be quite an investment but hopefully it should pay off in the long run. It'll be nice to put my knowledge of sheep back into practice - so long as I haven't forgotten it all! If we don't get sheep soon then I might have to make hay on the bottom patch as it's so lush. I'll do more information on the fields in another post. I'm really excited about this - should be a lot of work but a lot of fun as well. 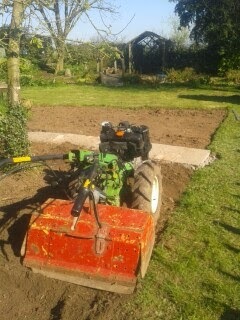 At the weekend I did a bit of work with the tractor, I tidied up some brash, moved some wood chip and some muck. The amount of time saved by using a tractor with a front end loader is ridiculous, it would have taken me days to do what took me a few hours. I moved a fair bit of cow muck on to Long Furrows ready to be spread about. I didn't drive over the plot just up the side and tipped it over the fence (that isn't there yet). I then spread this muck out by hand, leaving an area clear a the bottom so I could grow some carrots there. Dread filled me as I dragged out the rotovator to give the plot another going over last night, but I managed to get it going first pull! I think I have the knack now and I might even write down how I did it so I can remember next year! The muck worked in really well and I went over the plot twice. the soil has worked down to a really fine tilth, I might even get some carrots and parsnips in tomorrow. All I need to do now is to finish fencing it then I can get on with the serious planting! Who feels they're behind on their planting this year? Some things I'm ahead with but I keep remembering things I've forgotten to put in! Last Friday night I planted up another unusual veg brought from eBay - Chinese artichokes. To be honest I was expecting them to be bigger, like the size of Jerusalem artichokes but these are the size of large grubs! I planted up two raised beds with these and I'll report later in the year how they do. A good friend of mine accuses me of collecting vegetables like "an American prepper collects guns" - his words not mine! I think having a large variety of fruit and veg is key to being self sufficient in food. That way you have things to fall back on should crops fail. Something like this is pretty easy to grow as well (so I'm told) needing very little input (like Jerusalem artichokes) but they're there in the ground if you need them over winter, or stored in a frost free place. Is anyone else expanding their collection of unusual fruit and veg this year? My mum is an avid carbooter, as was I until I got so there wasn't enough hours in the day! So instead I give my mum a list of things to look out for. One of the things was a graft, at least that's what I've been brought up to call them, they have other names like trenching spade, or drain spade. My mum picked this one up for a few quid and it works really well, the blade isn't on too much of an angle like many of the new ones they sell and there is some serious weight behind it making digging deep a little easier and breaking through roots. I used it a lot last week and it performed really well digging holes for some rose arches I was installing (not for me unfortunately). It does have one feature that my dad affectionately calls a "pocket ripper". I think you either love or hate this style of handle, it's not seen that much on new spades or shovels any more, but it's on lots of older tools. The name comes from when you're using it and you accidentally catch your trouser pocket on it and rip it off with your own momentum! Very funny when it happens to someone else! This type of handle doesn't upset me and I'm quite happy to use it. What does everyone else call this type of spade? Does anyone else hate this type of handle like my dad? With my less than ideal storage conditions much of my garlic is starting to sprout, a timber shed just isn't the right place for it. I wish I preserved some of it last summer when it was at it's finest but I'll just have to make plans for that when I harvest it this year and not save so much to use "off the bulb". Having this sprouting garlic has given me an idea though and I've decided to have a little experiment with growing some single cloved garlic, I've read people sometimes call it lazy garlic as there is less to peel! The theory being that garlic needs a month of cold weather to separate into lots or cloves inside the bulb. By planting now when the worst of the cold weather is over it should grow nicely but as one large clove, kind of like elephant garlic (but not obviously) but with the stronger flavour of normal garlic. I divided four bulbs of garlic up and separated it up into large cloves and small ones. The large cloves I then planted at normal spacings for garlic (about 6-8 inches) and fill the bed up with them. The small ones I planted really close together with the intention of pulling these green and using them almost like chives. I'm not sure how well this will work, if at all, so please don;t copy me, but I thought it might be an interesting use of some garlic that was well past it's best! I'll report on these later in the year. Anyone else grown garlic with the intention of growing just a single clove? It'll be interesting to compare it to my other garlic that was put in during the autumn and the elephant garlic as well. I put on my facebook page last night that I was having nettles for tea and Sue from Our New Life In The Country Commented back about what I could make with it. It made me think about the first time I posted about nettle soup, three years ago almost to the day, that was the first time Sue commented on my blog after I got mentioned on Rhondas Down To Earth Blog on her Weekend Reading section. Before then I'd only had a few comments and that seemed to be the catalyst for having much more interaction with people in blogland and I haven't looked back since! So thank you Rhonda and Sue for that memory! Any way back to the nettle soup! I decided to make use of one of my wild "crops" that is growing on our homestead. Unfortunately to pick it I didn't have to go very far from my back door, the fact they were all picked within 20 yards doesn't say much for my garden really does it! I tried a different recipe this time, following one from river cottage (find it here) but I have to admit to not being that impressed with it. We did visit River Cottage once, many years ago before children, for a Saturday night meal and I've been trying to recreate their recipe ever since. I think this is why I'm always left slightly disappointed at my own attempts. This was still nice with a fresh baked loaf of granary bread but it wasn't what I remembered. Does anyone else have a good recipe for nettle soup? One that might live up to what I've built it up to in my mind! I've been using my planner a bit lately with the work that I do and it's given me a waste product I'm not sure how to use. The offcuts make great firewood and kindling but the sawdust isn't as useful. Although I've happily been using the waste product from my brothers work, in the form of wood chip on the garden, I'm still not sure with what I should be doing with mine. Sawdust from dried oak boards produced loads of tannin when it gets wet and all the water that pools around it turns black, not something I want to be spreading on the garden then! The ton bag below was produced from one mornings worth of planning up oak boards, so you can see how easy it is to amass a fair pile in a short space of time. Any softwood shavings are used as chicken bedding that are then composted down, but I'm still not sure what to do with all these oak shavings or other hardwoods, I'm creating huge amounts but it would still be good to put them to use. Any suggestions? And I haven't got any meat to smoke so that's out for now! I've had a frustrating couple of evenings trying to get my rotovator to start. It's been sat for a while so I knew it wasn't going to be easy to start but I was getting pretty mad by the end of the first night. It's a pull start diesel, and it needs some serious pulling to get it going at the best of times, you end up pulling the machine around as you launch yourself in the air to get enough momentum to turn the engine over. After a few hundred pulls I decided to ask my dads advice and he said it could be the diesel had gone stale, now it contains more bio-diesel it can go off and not be as good after it's been sat for a while. I drained the tank, got covered in diesel, and then connected it all back up. I then took the pipe off nearest the injector and pulled the start until diesel came through, then I tightened it all back up and pulled! Well nothing except sweat and a sore arm! I then went over to see my neighbour to see if he could offer any advice and I was contemplating the can of easy start (despite the fact I was worried it might pull my arm off if it worked). He watched me pull it and said the decompression level was kicking over too soon, he held it half way on whilst I pulled and within six tries there was life! We had to leave the container pretty fast as it filled it with smoke in seconds, but it soon cleared and the engine puttered along nicely. Age and experience saved the day and I learnt quite a bit in the process. It would have been much easier to get someone to come and get it going for me, but this way I gained some valuable experience. Now all I've got to do is getting going when there's enough daylight left to use it! Anyone else been struggling to get something going lately?